Have you ever entered a classroom in the middle of a lesson where students are gleefully and intensely engaged in what they’re learning? You can almost feel the electric quality of the atmosphere when a lesson is truly working and all learners at every level are engaged with the lesson; they’re enjoying it and extremely engaged, and that makes for great learning. But kids today have been more exposed to and influenced by interactive technology than ever before. So any opportunity to incorporate fun games that are interactive and educational into your lesson plan increases engagement, class moral and learning. We know it’s tough to keep students engaged all day. So, here’s what you need to know about interactive education games to create powerful, fun lesson plans. What Are Interactive Educational Games? Interactive educational games not only initiate receptive and productive learning skills, like listening, reading, speaking and in some cases, writing, they also serve to build skills across a spectrum of social and mental competencies. Let’s take a look at what interactive educational games are—and what they’re not. An easy way to look at interactivity is through the “Input-Output Theory of Interactivity”. It’s just a way to look at students’ relationship with technology as a cause and effect process that creates engagement and enjoyment. A student takes an action as the “input,” and the result is the “output.” That happens each time a student enters information to search online, hits enter, and receives search results. But when it comes to interactivity and games, the most engaging ones offer tons of opportunities for input and output over the course of the game–and you’ll find the best games are when that “cause and effect” happens almost instantly through some sections of the game. You Know What a Game is, Right? You know when something’s fun, and when it isn’t, but does that make it a game? A game isn’t just one part of instruction, like reading or writing. In order for a lesson to feel like a game to kids, it has to “feel” competitive to them. Whether your students are competing against themselves, as in beating their best results on a computer game, or with other students, the main ingredient in your interactive game lesson must be a pay-off. Kids love this and it makes for great learning. An interactive game has to help your kids learn and support all students in meeting the learning objective of a lesson plan. But it can be challenging for teachers to create a lesson that uses interactive technology, is constructed as a game and better supports learning than a traditional lesson model. Combining all these components can feel overwhelming, given your daily responsibilities and work load. But taking the time to do so, and using some of the examples we’ve provided here, will be a great benefit to your students in the long run. 1. Interactive games serve varied learning styles. For instance, you might have a student who struggles with social interaction, or answering a question in a complete sentence, which is a Kindergarten Common Core Standard. A game where this student needs to answer in a complete sentence might be less stressful than a traditional lesson plan and thus more supportive to your student in meeting that standard. 2. Interactive games touch on all aspects of engagement. In his book, Digital Game-Based Learning (2007), Mark Prensky notes all students in the classroom today, from Kindergarten through college-level students, have grown up with “digital formative experiences.” Our students have literally been programmed differently than any generation before them. Our classrooms and lesson plans need to reflect this. Through interactive games, kids can practice their inferential, analytical and reasoning skills. There’s also an intensity to games that’s missed in the comparative flatness of simple reading or lecturing. Really, kids who spend a large part of time consuming vibrant gaming experiences outside of your classroom can feel distracted or bored if they’re not equally as engaged in class. 3. The by-product is better class management. One teacher we spoke to told us about a lesson plan she developed based on the popular television game show “Jeopardy!” After a mini-lesson on fractions for her fourth graders, she split her class into two teams to compete on fourth grade Common Core Standards of “Understanding Decimal Notations as Fractions.” Using the class Smart board for both the show’s signature soundtrack and the math “answers,” and modeling the lesson first, the teacher asked students to change fractions into decimals or name math vocabulary. She leveled the answers according to learner’s needs. Her class was wholly engaged with the lesson through play, and the team that won got to sit “around the room” during reading as pay-off. The game lesson also gave her a chance to assess her students. For Language Arts, technology teacher Mary Beth Hertz wrote about a vocabulary-building lesson that incorporates technology for middle school students. For an upcoming vocabulary test on 25 words, a student was assigned a word and asked to create a short “movie” in their school computer lab using images and other describing words to show the meaning of the word. Images, moving visuals and synonyms reinforced learning by bringing the vocabulary words to life. For this game, you can group students in pairs to better support your second language learners. Then, students review all the movies in class. After, have each student pick a card from a pile with synonyms that match the vocabulary words and read it to the class. Ask your students to match the synonyms to their vocabulary words on a “Bingo-type” board. You can play to the end with all the words where along the way many students will get all words across, down or diagonal, allowing for many of your kids to win. Decide on a great pay-off, even if you keep it a mystery through the game. Maybe it’s extra reading time or bonus points for the upcoming quiz. You know your class and what will excite them to win. Students are particularly engaged when they have the opportunity to use a school computer lab to play interactive educational games on their own. One site iplaymathgames.com is a standards-based game site that builds grade-school math skills. Another favorite site is: arcademicskillbuilders.com. Not only can students play against themselves, but they can also challenge classmates and other students nationally. Even better, you can print out scores and assess their learning through their scores. The USA.gov site provides learners with interactive games that can be played on Smart boards or desktop computers. Free social studies games here increase students’ geography, political and history knowledge. Organize students into desk groups and have them match a location on a map print-out of where the Secretary State is “visiting,” to the location on the Smart board. Your kids will build geography knowledge as well as their understanding of the Secretary of State’s role in government. Having trouble organizing your class into groups? Try our Pick Your Partner tool where students pick a card and the name comes up on your Smart Board. “Name order” for group creation or classroom set-up is another great tool to use when developing a group lesson. Maps of every part of the world are available through Gynzy’s interactive Smart board tools. You can use these maps as part of the “Secretary of State” game or for any lesson. 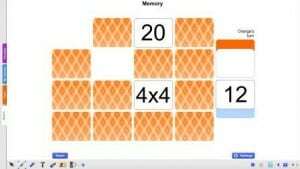 Create your own Memory Game, a Gynzy tool for interactive Smart board gaming, is a great way for students to test and build their math vocabulary. Learners from Kindergarten to middle school enjoy the competitive aspect of this game. Our Floating and Sinking Game is a popular one. Why does something float or sink? Can your students support their theory based on lesson information? Groups will come up with group answers in a limited time and whoever has gotten the most answers right, wins. This is an excellent game to play and discuss prior to doing their own in-class “sink or float” experiments, too. Smart board Hangman extends vocabulary while engaging grade school students. They compete against each other until they either win or loose. Students practice decoding, blending and word and letter correspondence as well as critical thinking skills. Interactive educational games serve to increase learning by catching up to the way our students are wired today. They increase social, critical and logical thinking skills while engaging your class and helping them reach their learning objectives. Remember to model technology use first, as well as set classroom norms and guidelines around using technology. Taking the time to include these games in your lesson plans will make for a fun and exciting year for your students.